Find out what our experts have to say about TVS Sport! The TVS Sport is an entry-level 100cc commuter but doesn’t look like one. It packs convenient features like all-gear self-start, pass switch, adjustable rear suspension, but despite the above lacked to make a mark for itself in the highly competitive commuter segment. 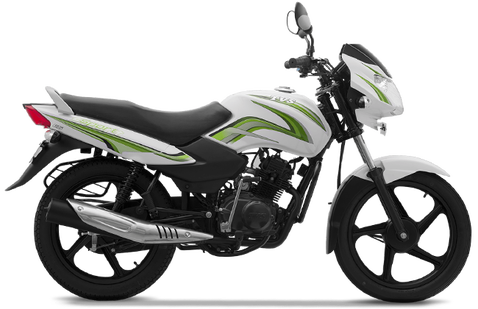 The least priced variant is TVS Sport Kick Start Spoke priced at Rs. 51,278 and the most priced variant is TVS Sport Electric Start Alloy priced at Rs. 58,301. Choose the TVS Sport which fits the bill of you. In India, the highest selling bikes are the commuter motorcycles and in these top the 100-110cc segment. So, it's evident that all the motorcycles would want to have the bigger share in this pie and there is a tough battle to be on top. Ruling the roost in this segment is the Hero Motocorp. The Hosur based two-wheeler manufacturer first launched the TVS Sport in 2007. It was relaunched with improved mileage in 2015. The bike was launched keeping in mind style and sportiness with the added advantage of fuel efficiency. It was targeted to the urban youth and new generation motorcyclists as a daily commuter. TVS launched the Sport with the BS-IV engine in 2017. With many segment-leading features, TVS Sport is one of the best bikes in the 100cc segment. It has also been awarded the “The Most Appealing Economy Motorcycle” and ranked No.1 amongst Economy Segment Motorcycles by JD Power APEAL Study in the year 2015 and 2017. Hero HF series, Bajaj CT100, and Honda Dream series are the main competitors to the TVS Sport. TVS Sport is available in three different variants. They include the standard kickstart with spoke wheels available at Rs. 40,088, the kickstart with alloy wheels costs Rs. 44,328, and the exclusive electric start alloy wheels retail at Rs. 46,919. TVS Sport is one of the best looking bikes in the 100cc segment. As it looks sporty and at the same time is a comfortable commuter for daily rides as well. At the front, the big headlamp with a black visor on top makes the bike look sporty and also creates a strong presence on the road. On the centre, the tank is simple but sculpted beautifully, and sporty flowing graphics accentuate the design. The new graphics also enhance the curves and edges of the tail panel which gives a modern urban look to the bike. At the rear, the bike gets a sporty tail lamp that completes the sporty look of the bike. Riding is very comfortable for the rider as well as the pillion due to the contoured seat. Aiding to the seat is the big comfortable aluminium grab rail that is strong and easy to hold. Chrome cover on the exhaust muffler adds a touch of class to the bike. With an Econometer in the instrument console, TVS Sport is the only bike in the 100cc segment to sport such a feature. It helps you to get the best mileage from your bike. Black Silver, Indigo Streak, Team Blue, Mercury Grey, Blaze Red, Volcano Red, Dazzling White, and Electric Green are the available colour options for the TVS Sport. Powering this nimble commuter is a 99.7cc, air-cooled, single cylinder, 4-stroke Duralife engine. It produces a humble power of 7.47PS at 7500rpm and a peak torque of 7.8Nm at 7500rpm. To reduce friction and ensure engine smoothness, TVS Sport is equipped with a DuraLife engine that has a Roller Cam Follower technology which also increases the life of the motor. The engine is mated to a 4-speed gearbox which is very smooth. With a fuel tank capacity at 10-litre including a reserve of 2-litre, this bike has the largest petrol tank capacity in the 100cc motorcycle segment. And its best-in-class mileage of 95kmpl gives it the ability to travel long distances easily. TVS Sport also boasts a top speed of 85kmph. TVS Sport being a commuter bike is very comfortable to ride in the city as well as on the highway. Riding posture is upright and very relaxed. To ease the jolts from the bad roads, the suspension system has a set of telescopic hydraulic forks at the front. And has the five-step adjustable spring-loaded shock absorbers at the rear, hardly seen in a 100cc bike. Braking duties are performed by 130mm drum brake on the front and 110mm drum brake at the rear in an adequate manner. Wheels are 17-inch alloys or spoke depending on what you choose. Tyres are at par with the competition with 2.75-inch thickness at the front and 3.00-inch at the rear. They provide enough road grip in the city or on uneven roads. TVS Sport is the only bike in the 100cc segment to feature a 130mm front drum brake which makes it safer than other bikes in its segment. As this is a 100cc commuter bike, the safety is at a basic level, but it surely gets the mandatory AHO feature. With this feature, the headlight always stays on to signal the oncoming vehicles about its presence. TVS Sport is very convenient as you can start the bike in any gear with the clutch lever pressed. To safely overtake in the night, the motorcycle is also equipped with a pass-by-switch with which you can flash your headlights while passing. The bike also comes with a 5-year warranty at no extra cost to minimise your maintenance cost.